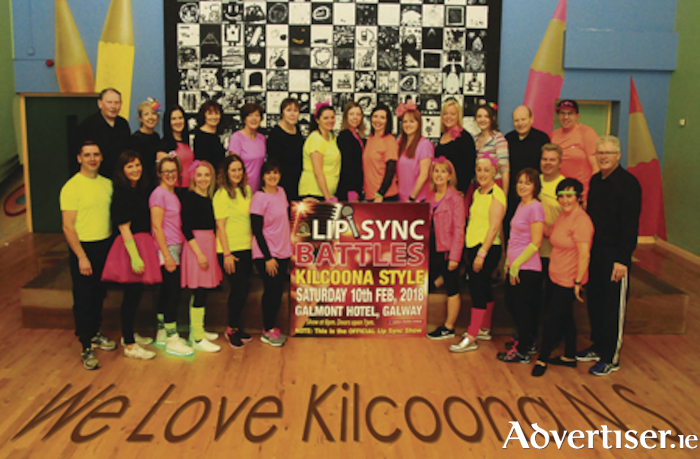 Move over Strictly…there’s a new show in town and this month, Headford is gearing up for a night to remember as staff, parents and friends of Kilcoona National School get ready to take to the stage for LipSync Battles Kilcoona-Style. On Saturday, February 10, the Galmont Hotel in Galway (formerly the Radisson Blu ) will be the place to be and the night promises to be jam-packed with fun, frolics and top-class entertainment. Nestled in the heart of north Galway, Kilcoona NS on the outskirts of Headford has long been recognised for its education prowess. This month however, it’ll be the talents of its teachers, parent,s and other well-known locals in the spotlight. In all, 32 brave souls will perform in 13 acts, with music and dance moves guaranteed to get the audience swaying in their seats. In 2016, Kilcoona NS enjoyed tremendous success with their Strictly Come Dancing event, which aimed to raise funds to build a soft play area and all-weather pitch behind the school. The aim, this year, is to continue with this development and finish the new astro turf facility on site. Former Kilcoona principal Tom Cradock – who was part of the Strictly line-up two years ago – is back in action this year like you’ve never seen him before. In an interesting twist, current principal Sabrina Melvin will be going head-to-head with Tom in LipSync and she’ll be joined on stage by some other teachers from the school. Professional fitness instructor Gary Scully will surely be one to watch out for in the Galmont Hotel on Friday, February 10, while local actor Gabriel Monaghan, who is no stranger to performance, is certain to entertain. The event is being coordinated by the team from LipSync Battles Ireland, with choreographer Charlotte Moore putting the Headford performers through their paces over the last few weeks and months. Charlotte has put a huge amount of time and effort into the routines ahead of the event and no stone has been left unturned to ensure a fantastic performance by all involved. The MC on the night will be none other than well-known presenter and comedian Alan Shortt, while the judging panel will be made up of Galway Bay FM presenter Ollie Turner, Pat Joyce of Joyce’s Supermarket, journalist Bernie Ní Fhlatharta and Aidan Tierney of Tierney Talks. Tickets for LipSync Battles Kilcoona-Style on Saturday, February 10, are just €20 and are available from the school, from a number of local businesses and from all of the performers. Doors open at 7pm, with the show commencing at 8pm sharp. A fantastic night of entertainment is guaranteed and all support would be greatly appreciated. Page generated in 0.1767 seconds.